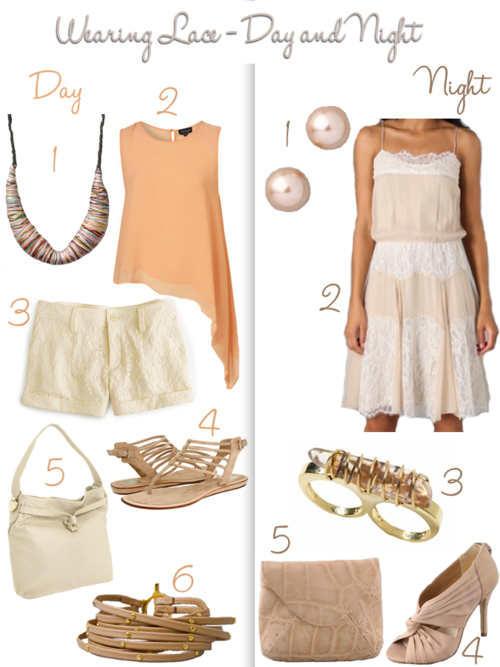 With lace being a huge trend right now, I thought providing some guidance on how you can wear it day and night might be helpful for some of you who aren’t sure what to buy. Lace shorts are a big hit right now, but there are surprisingly few options available at the moment (I am hoping there will be a surge of them in the next couple months because I am dying for a good, solid pair). While lace dresses are abundant, many are in black, which is a color I love, but for spring and summer I enjoy more neutral colors, especially when dealing with lace. Above are two looks I pulled together – some items are budget-friendly, some are not! Mix and match as you wish!